Stress is not a new phenomenon for the busy executives like you. If you accept stress and let it stay in your life permanently, it will invite with itself a long list of diseases, read depression, hypertension, diabetes, heart attacks, and so on. If stress has become a frequent guest in your life, it’s time you start eating foods rich in magnesium for stress. Magnesium needs no introduction. We all know that it is one of the essential minerals needed by our body. But, do you know why exactly we call it essential? It is because your nervous system needs it desperately to keep working at its best. Your brain needs it to stay calm and relaxed and your nerves need it to avoid irritation and agitation. In short, you can use magnesium for stress to ensure this uninvited guest stops visiting you. The deficiency of magnesium can increase the cortisol levels thus contributing to anxiety, brain fog, and panic attacks. You can avoid these symptoms by using Magnesium for stress. This mineral can restrict the production and release of cortisol, a stress hormone. 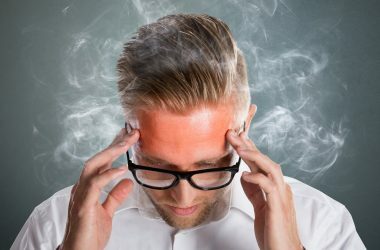 It can also help you avoid brain fog, a kind of mental block that destroys the creative thinking skills of executives. Magnesium can reignite the brain functions and boost your creativity thus improving your productivity while reducing stress through its inhibitory effect on the cortisol production. If you are getting too stressed, consider getting a bit of extra help. Spire is a stress management and activity tracker that reminds executives to control their breathing through alerts triggered by respiration patterns. Magnesium for stress reduction works by binding to the GABA (gamma-aminobutyric acid) receptors in the brain. The results of a study published in Neuroreport have reaffirmed that magnesium has the potential to stimulate the activity of GABA, which is an inhibitory neurotransmitter. A low level of GABA can cause you to feel easily overwhelmed even at the thought of attending a seminar or giving a presentation. 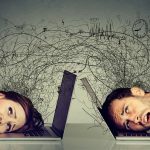 It can cause irritation and anger, which are not positive virtues to have while interacting with your clients, colleagues, and other team members. Chronic inflammation can take hold of the healthy organs in your body, and that includes your brain. Inflammation of the brain can increase the risk of anxiety, depression, and memory loss. Research published in the journal of immunology has confirmed the anti-inflammatory properties of Magnesium. This mineral can destroy the inflammatory messengers of the immune system called cytokines thus inhibiting inflammation in the brain. It can prevent cytokines from destroying the brain tissues and altering the functions of this vital organ. This would help you avoid the symptoms of stress such as anxiety, memory loss, depression, apathy, irritability, slowed responses, inability to focus. 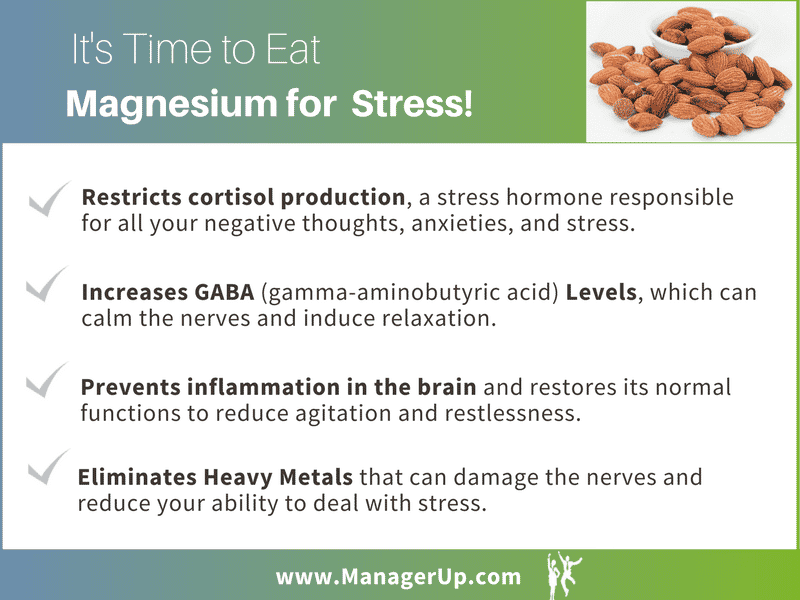 Don’t you think these benefits of using magnesium for stress offer a great ROI for you? A study conducted by the Italian researchers and published in the Magnesium Research to examine the role of magnesium in the brain activities have shown encouraging results. It was found that this mineral can reduce stress levels and improve your ability to cope with the challenges at your workplace and personal life. It works by supporting the elimination of toxic, heavy metals like mercury, and lead from the body. These toxins can cross the brain’s filter called the blood-brain barrier and accumulate in this organ resulting in considerable damage. Now that you have realized the immense potential of magnesium for stress reduction, you must be eager to find out the foods that contain this mineral. Below is the list of foods having a high amount of magnesium. Have you been told to “relax” “calm down” etc. too often? If yes, you should take a chill pill! I mean, you should take magnesium supplements or increase your intake of magnesium-rich foods. It will ensure the feeling of being calm and relaxed comes naturally to you. When this mineral enters your body in abundance, it improves your mental health and drives out stress and the diseases it brought in with itself. 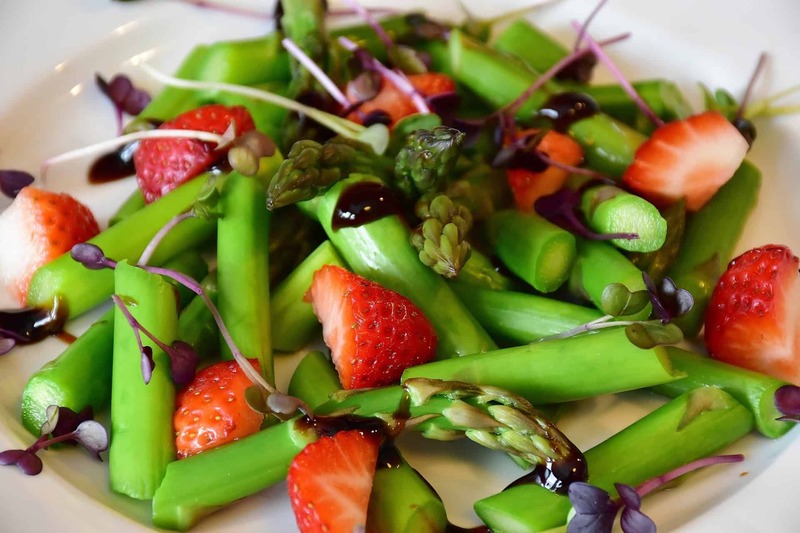 Do you want to learn more about foods that fight stress? IMPROVE YOUR STRESS RESPONSE WITH THESE NATURAL FOODS TODAY! We want to hear from you. If you have started using Magnesium for stress, please share your experience with us in the comments! I actually have a bit of advice for people who have read this and are looking to increase their magnesium… If you have ANY kind of stomach or digestive issue there is a good chance you are not able to fully break down and absorb the magnesium as most of it gets absorbed through the gut. Add chia seeds to your diet and do a 20 to 40 minute foot soak at least 5 nights a week with Epsom salt. You will be able to absorb the magnesium this way without it having to go through your digestive system if you have issues like me. Plus, it is a great way to relax. If you can do bathes, just do 3 a week with Epsom salt.